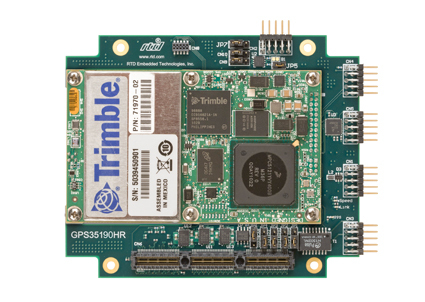 The GPS35190HR is a low-power wide operating temperature range GPS receiver carrier module for use with the Trimble BD970. This receiver will work reliably in a variety of installations. 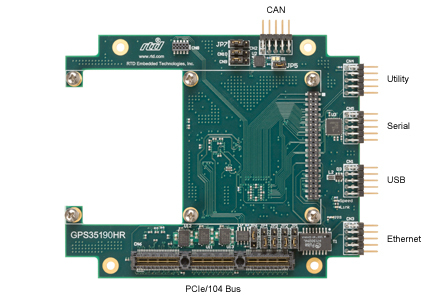 Integrated on the GPS35190HR board are four complete 16C550 compatible serial ports that can be flexibly configured with jumpers to communicate with GPS or I/O connectors. The GPS antenna connects directly to the BD970. Starter kits are available. In IDAN® installations the antenna connection is brought to the front side of the IDAN frame. Note: Specifications for GPS35190HR carrier module only. Specifications for GPS module may vary. GPS35190HR Carrier module only. Trimble engine not installed. GPS35190HR-BD970 Carrier module with Trimble BD970 module installed.